How is it possible for a movie like Tomorrowland to maintain its shroud of mystery? In today’s day and age, when Internet sleuths pick apart every aspect of each potential blockbuster, we still know relatively little about Disney’s live-action sci-fi adventure… even though it opens in theaters in a few months! 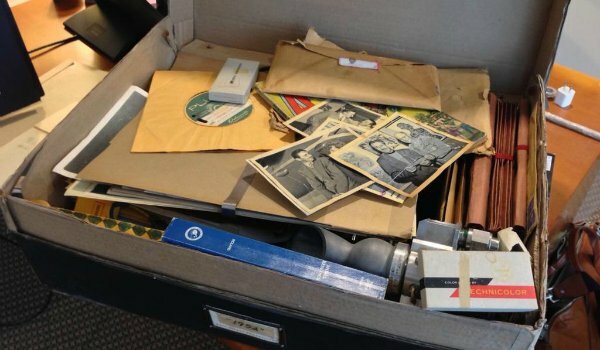 With the teaser trailer landing online, and a New York Comic-Con panel pulling back the Tomorrowland curtain ever so slightly, we figured now was as good a time as any to start unpacking the Mystery Box that holds all of this film’s juicy secrets. 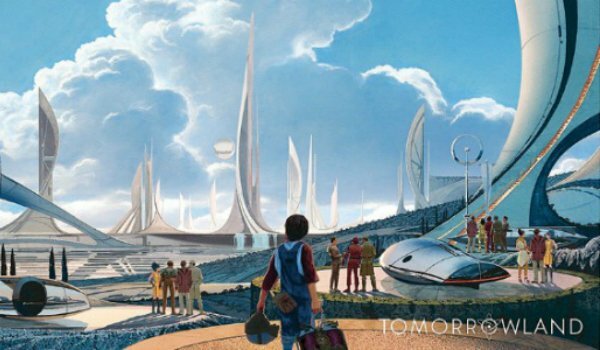 We combed through the CinemaBlend archives and have constructed a sturdy What We Know So Far guide for Tomorrowland, starting off with the plot of the movie – a hint of what’s to come. Back when it was first announced, Tomorrowland was known as 1952, a clue that interested parties once thought hinted at several possible plotlines for the film. The term "Tomorrowland" references a section of the Disneyland and Walt Disney World theme parks, and early rumors tied Tomorrowland to the history of Walt Disney, the construction of the parks, or something deeper than that. All of this is still possible, but the studio at least unveiled an official plot synopsis for Tomorrowland, revealing that it would be about a "former boy-genius [and] a bright, optimistic teen bursting with scientific curiosity [who] embark on a danger-filled mission to unearth the secrets of an enigmatic place somewhere in time and space known only as ‘Tomorrowland.’" OK, sold. We’re in. What else have you got? Tomorrowland will be directed by Brad Bird, helming his first picture since Mission: Impossible – Ghost Protocol (which successfully reinvented the Mission franchise for Tom Cruise). Don’t mistake Bird for an action gun-for-hire, however. His earliest pictures were animated… and brilliant. The world learned about Bird through the touching and heartfelt sci-fi/family adventure The Iron Giant. He then transitioned to Pixar for The Incredibles and Ratatouille -- where he proceeded to collect two Oscar statue. Bird’s not the kind of storyteller who can be pigeonholed, though, and Tomorrowland looks like it will be as imaginative, inspirational, challenging and wondrous as all of the films on the director’s resume. The question is whether Tomorrowland will be closer in tone to what Bird does – or to what his screenwriter does. Tomorrowland marks a mysterious collaboration between Brad Bird and screenwriter Damon Lindelof, and… hey, wait! Where are you going?! Don’t run away. Yes, I know that Lindelof has an uneven track record with genre geeks, and that the amazing work he has done on television programs like Lost and the current The Leftovers is overshadowed by rewrite work he did on films like Prometheus, Star Trek Into Darkness and Jon Favreau’s Cowboys and Aliens. But Lindelof’s the key to Tomorrowland. As the story goes, the screenwriter got the idea for the movie when he was handed a box on the Disney lot containing a bevy of intriguing clues, which he built into the mythology of this new film. 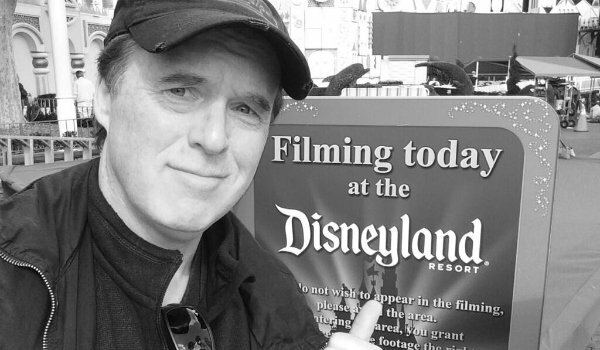 Brad Bird Tweeted a photo of the box’s contents with the sentence, "The Box… opened." And the two picked through the clues during an on-stage presentation at Disney’s D23. They even released an app to help you figure out the clues. Too much "Mystery Box" nonsense? Maybe, but those who are still craving more will devour what Tomorrowland has to offer. In an interview with Collider, Lindelof recently revealed that Tomorrowland is a mysterious place that is accessible to limited people during limited amounts of time. He explained that the movie will be about finding that land. But it also will be about answering questions about WHY we can only access it at given moments. (Sounds very Lost-y, right?) And he admitted that there are multiple villains trying to prevent our heroes from getting to Tomorrowland, but more on these characters in a moment. If movie stars still sell tickets, then Tomorrowland should fill a few theater seats by having George Clooney on the marquee. 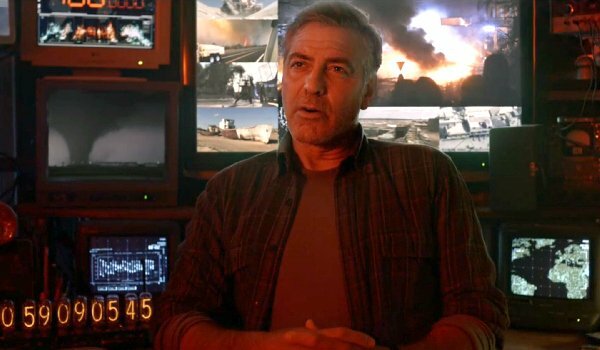 Clooney plays Frank, the jaded inventor who – as a child – had access to Tomorrowland and now regrets that this wondrous land is being kept from him. At least, that’s what we believe motivates Clooney’s character to help juvenile delinquent Casey Newton (Britt Robertson) on her quest to get to Tomorrowland for herself. We also know that Thomas Robinson has been cast as Young Frank Walker. So, time travel? Or flashbacks? Could that be young Frank using the jet pack in the end of the teaser trailer? During a recent appearance at the NY Comic-Con in support of Tomorrowland, Clooney told crowds that this film was "larger than most things I’ve been around," adding that "the beautiful thing about it is that Brad has a real vision of the film he wants to make and it was fun to play in this giant toybox with him." He also brought a longer scene that takes place after this spectacular trailer, which shows Robertson’s character trying to break into Clooney’s home, only to have the duo evading intruders before escaping in a bathtub rocket. Hopefully that footage ends up online soon! 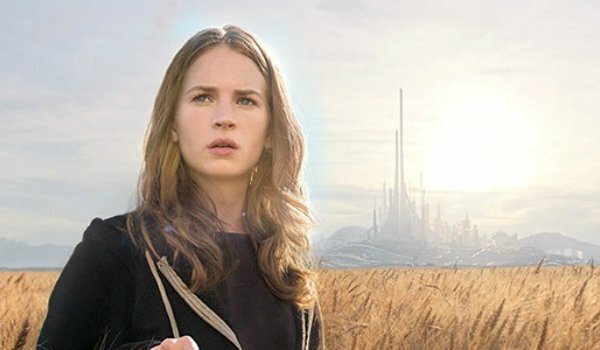 George Clooney might be the biggest name on the Tomorrowland poster (which looks like this, by the way), but the teaser trailer for Brad Bird’s latest put all of its attention on young Britt Robertson and her impressionable character, Casey Newton. The actress is best known for her TV work on Under the Dome, Swingtown and Life Unexpected, though she turned heads when she won the role of Casey opposite Clooney. The teaser suggests that she has gotten herself into some trouble, retrieving her possessions from what looks like a holding cell. When she picks up a mysterious pin that has been included with her goods, she’s magically transported to Tomorrowland. But how can she get back? Laurie’s role in Brad Bird’s Tomorrowland is one that’s being swallowed up in the secrecy of the project. 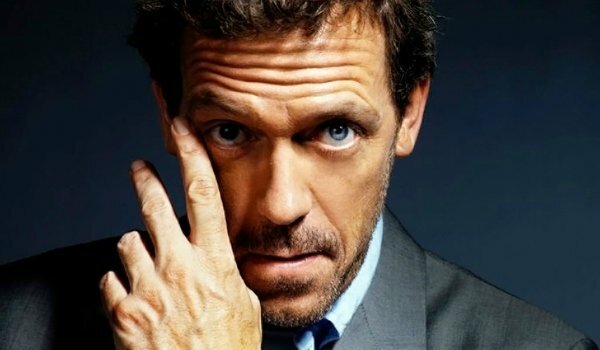 The House star wasn’t present in any of the footage shown online or at New York Comic-Con, and so all we can go on is that fact that we know he has been cast as David Nix, the villain of the piece, and the chief antagonist to George Clooney’s long-time inventor. This interview with Laurie from NY Comic-Con reveals a few more details about the part… but it’s clear that Bird wants to keep this sinister character close to his vest. Check out the rest of the Tomorrowland Comic-Con panel here. Seeing as how the mystery surrounding Brad Bird’s Tomorrowland is largely intact, we’re surprised at the sheer amount of information we have been able to pull from the movie as we tracked its progress through production. Casting choices have opened up several interesting doors. For instance, we know that Judy Greer has reunited with her Descendents co-star, George Clooney, for a supporting part in Tomorrowland. We reported earlier this year that Kathryn Hahn accepted the role of Ursula in the movie. It is being described as a small yet significant role, and has the potential to be a scene-stealing part. We also know that Bird cast a young Raffey Cassidy as Athena, a robot who reportedly assists George Clooney’s inventor character. Outside of Brad Bird’s cast, we reported earlier that Oscar-winning composer Michael Giacchino will pen the music for Tomorrowland -- as if you needed any more reasons to grab a ticket for opening day. Giacchino, of course, has been a long-time collaborator with Bird, having composed the musical scores for Ghost Protocol, Ratatouille and The Incredibles. We will be able to hear their latest magical collaboration when Tomorrowland opens in theaters on May 22, 2015.